53 cars are in attendance tonight at East Bay Raceway Park. The field is set to be divided into six heat races. Brian Shirley is in the pit area after his wild ride on Saturday at Golden Isles. However, his car stalled during hot laps. Kyle Bronson, the hometown driver is quickest in group A with a 15.036. Brian Shirley sets fast time in group B at 14.996 seconds. He did that without a lap of practice! Kyle Bronson and Tyler Erb set the front row in the first heat race of the week. Green, Bronson gets the jump. Bronson explores lanes on the track. Erb is hanging with him. Lap 5, Erb has a run on the bottom off turn two. He slides up to the wall on exit to take the lane away from Bronson. Erb gets a shove into turn three but he holds the position. Tyler Erb drives away to win the first heat race of the night! Hudson O’Neal and Tanner English trail the pace truck ahead of heat two. Green, O’Neal leads on the bottom. English is fighting back on the top. Lap 2, He gets to his right rear at the entry to turn three. They run side by side for the lead. The caution is out for a spin at the back. Green, Jameson swings by English on the outside to take 2nd. English is losing spots. English is around in turn three. He’s pointing and upset with someone as the caution is out. Green, Don O’Neal is on the move. He and Jameson swap the 2nd position. Don holds it and sets sight on his son. He’s chasing him down but he’s going to run out of time. Hudson O’Neal takes the win in heat two! 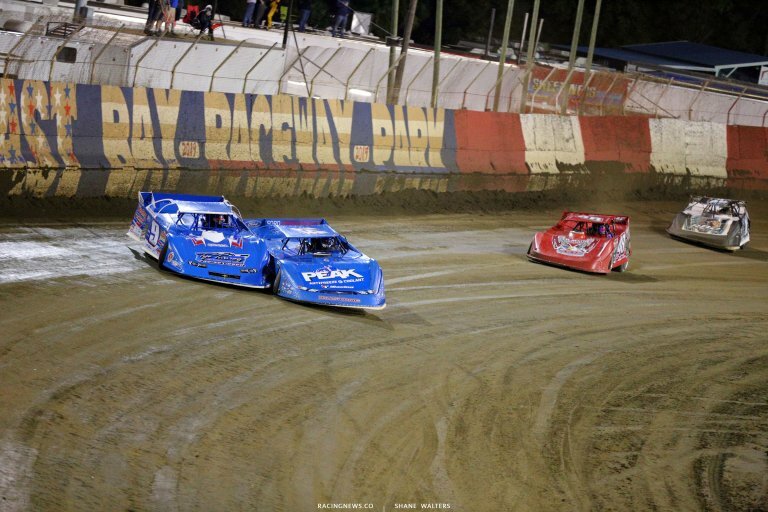 Billy Moyer and Josh Richards lead them off turn four in heat three. 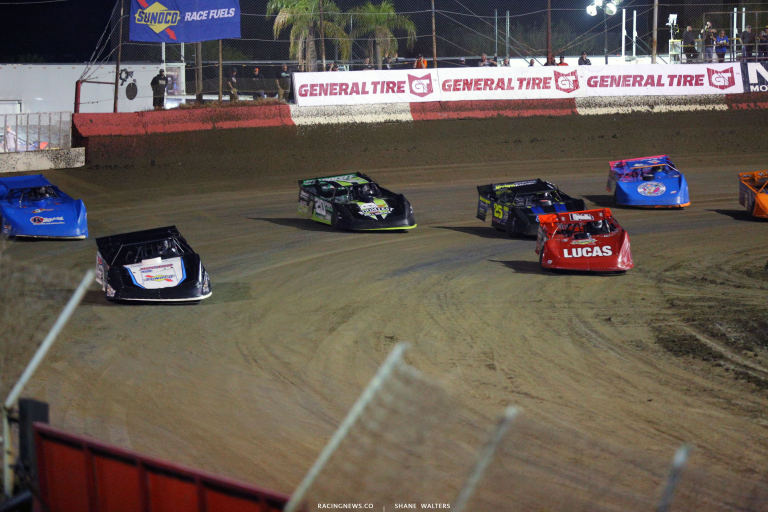 Green, Moyer noses ahead into turn one. Richards fights back on the top. Richards crosses him on the exit up turn two. They bang fenders and fight for space into turn three. Richards drives it deep on the bottom, slides him and clear. Caution. Green, Richards leads by a car lengths off turn two. Moyer drives it deep on the bottom. Richards cuts from the top to the bottom as they make more contact into turn three. Spin as two cars fight for the bottom lane. Green, Richards opens a gap. 4 to go, Moyer has found speed on the top. He’s closing in a hurry. 1 to go, he’s there. Moyer cuts to the bottom in turn one and pulls to his number. Richards gets the better run of turn two. 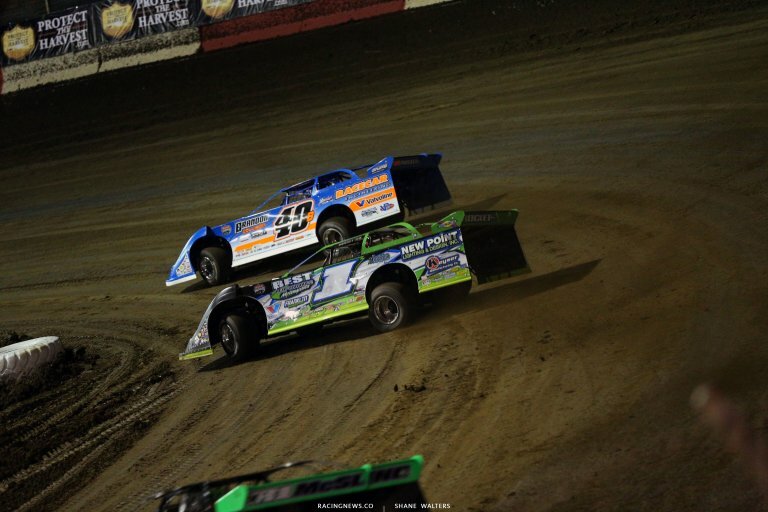 Moyer heads for the cushion in turn three. He cuts under him with a run off turn four. They race to the line, Richards takes the win. Brian Shirley and Jonathan Davenport head for the flag stand. 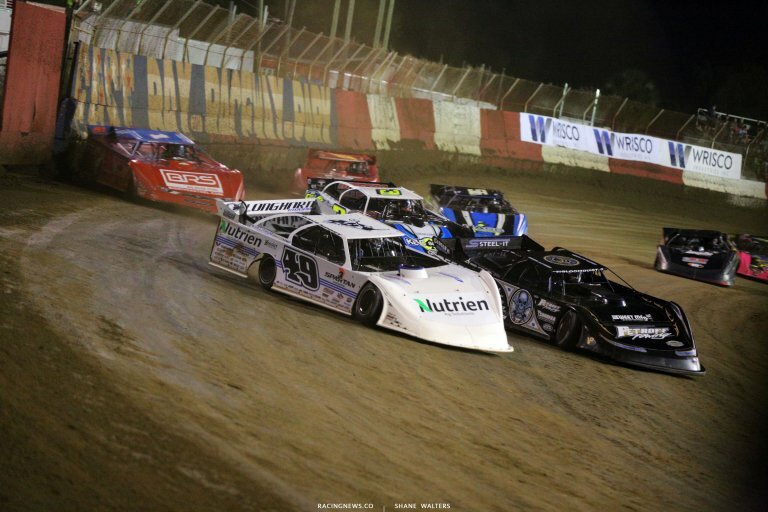 Green, Shirley gets swamped as both Davenport and Bloomquist drive by. 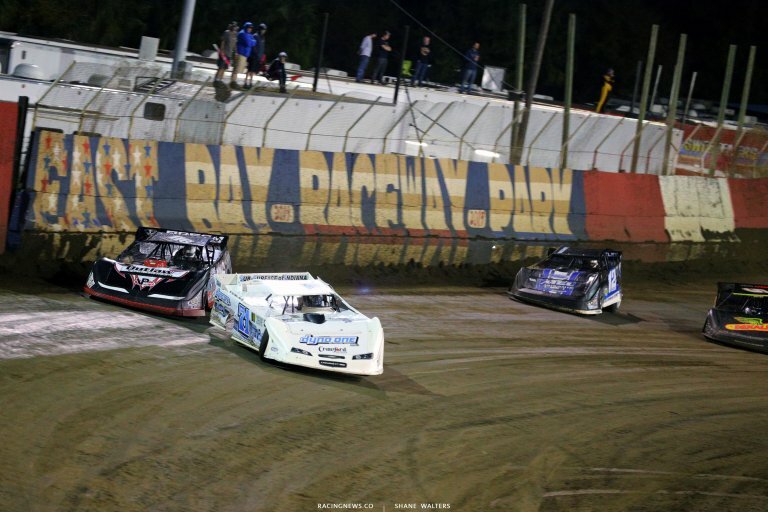 Bloomquist, Shirley and Moran run three wide off turn two. Davenport leads into turn three. 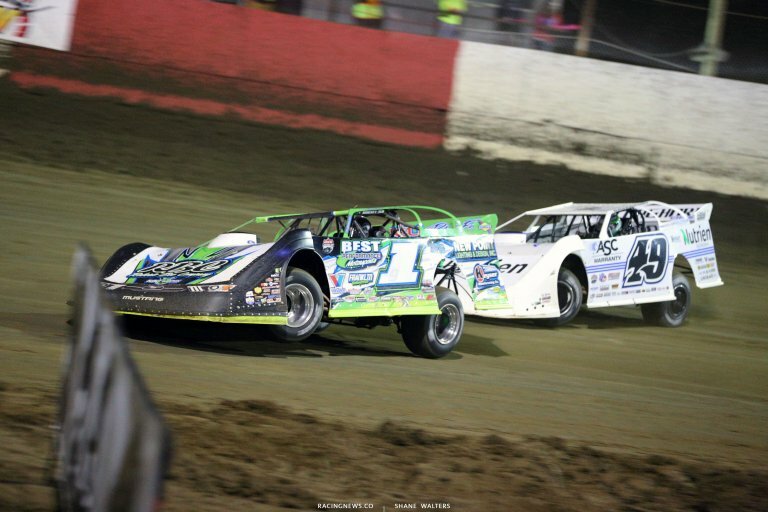 Bloomquist has a look to his inside. 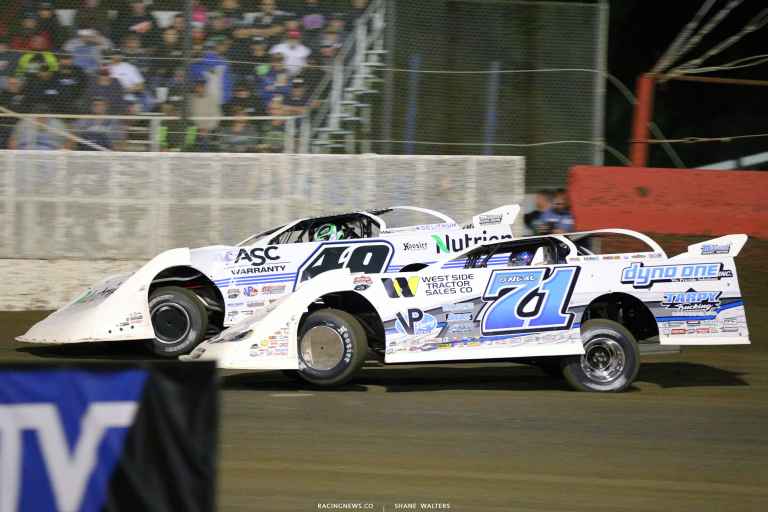 Davenport holds the lead off turn four. Green, Davenport leads. Moran to 2nd on the outside. Davenport is entering turn three higher than anyone has all night. He’s driving away. Brandon Sheppard and Gregg Satterlee set row one in heat five. Green, Sheppard gets the jump. Satterlee and Gilpin slide each other for 2nd. Caution. Green, Tyler Carpenter has found speed on the top. He drives by Satterlee on the outside of turn four and lights up the brake pads into turn one. Final lap, Satterlee pulls even with Carpenter for 2nd down the back. He cuts to the bottom, slides to the top and clears him. Carpenter drives under him as they race to the line. Satterlee takes the spot. 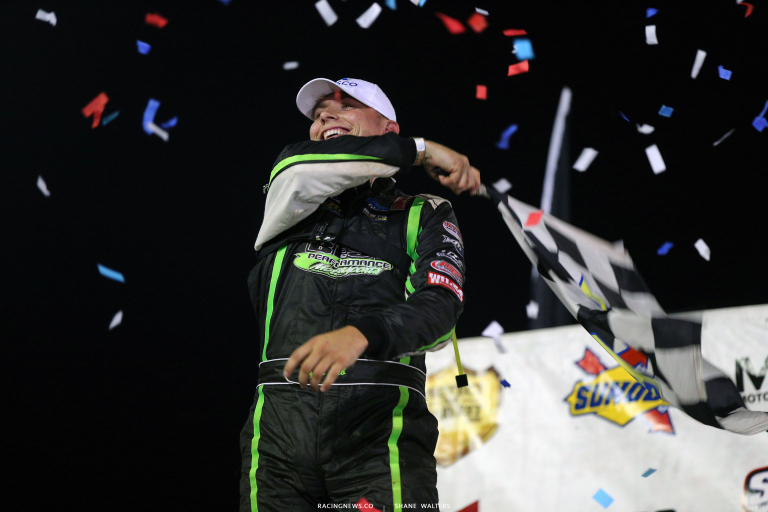 Sheppard was in his own zip code as he took the win several seconds earlier. Chase Junghans and Dennis Erb Jr the start in the final heat of the night. Green, Junghans leads into turn one. Pearson holds 2nd. Lap 5, Owens is coming around the top. Dennis Erb Jr is coming on the bottom. The split Pearson off turn four. Junghans takes the win in the final heat of the night! 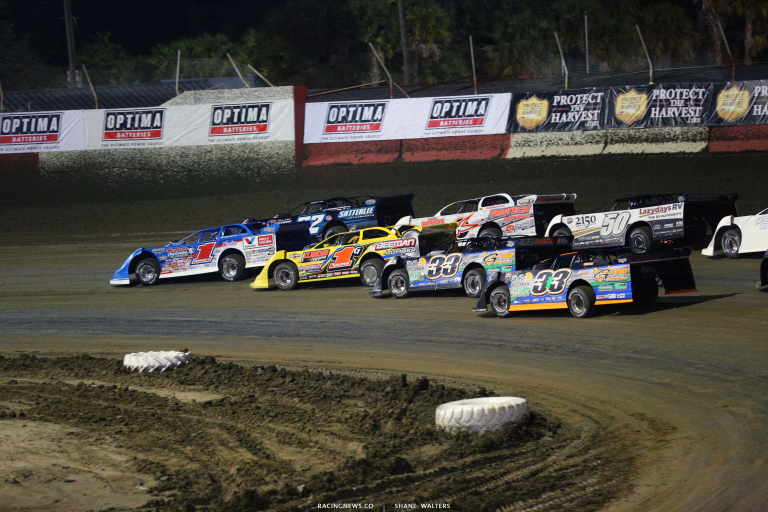 It’s a 30 lap main event at East Bay Raceway Park. No points are awarded but there’s $5,000 on the line. Tyler Erb and Jonathan Davenport lead the field to the starting line. Green, Erb drives it deep on the bottom. He rolls through the bumps. Davenport is hanging on his right rear. Owens is around in front of the field! One car collects him but minimal damage. The caution is out. Green, Hudson O’Neal has a run under both of them! They run three wide for the lead into turn one! O’Neal slides from the bottom to the top. Davenport and Erb fight for space. Davenport has a run off the top. He crosses under Neal at the exit of the corner. Davenport drives it a mile deep on the bottom in turn three. He’s clear. Hudson O’Neal has a run off the top. He crosses him on the exit. Hudson O’Neal noses ahead into turn one. Davenport is hanging on his right right. He gases it through the center and pulls even. They run side by side off turn two. Davenport has the drive off the top. The #49 reclaims the lead. Lap 9, Josh Richards, Brandon Sheppard and Tyler Erb are running down the leader in a hurry. Richards takes it. Sheppard takes it. Now Tyler Erb takes it. That all happened in two laps. Lap 22, Tyler Erb is trapped behind the laps cars. Blue flags wave aggressively. He checks up down the back and Sheppard closes. Sheppard loses ground and comes under fire from Richards. Erb is driving away. 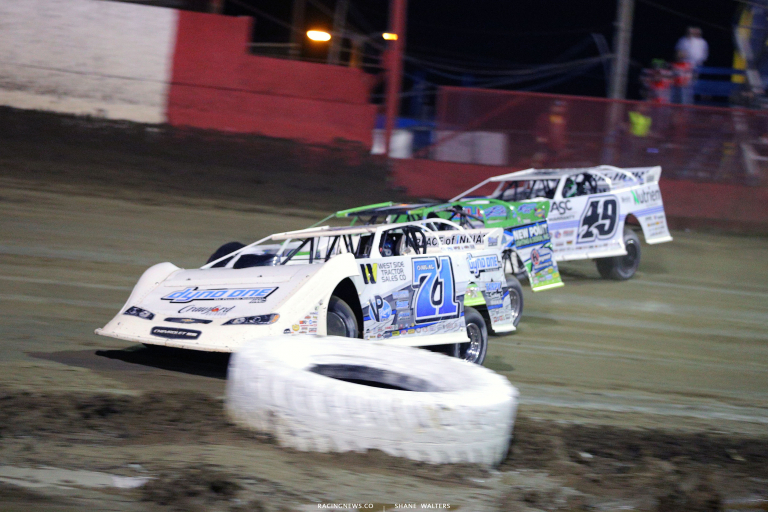 Tyler Erb takes the win in the first night at East Bay Raceway Park!